The GC5050 is a high speed Dynamic Digital I/O card that provides capabilities comparable to high speed I/O products found in large functional test systems. 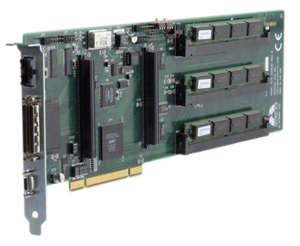 The card shares an identical architecture with the GX5050, a 6U PXI card. Both have the ability to operate independently of the host computer when in the RUN mode. The GC5050 provides real-time digital stimulus and capture with 32 pins per card. Up to 16 cards can be daisy-chained for a total of up to 512 pins. The 32 pins can be configured as input or output groups of eight. The direction of each group can be changed dynamically with the sequencer, externally, or both. There is also a 16-bit external bus for triggering and synchronization with external events. Clock and strobe signals are distributed to the cards via a daisy-chained ribbon cable. These signals can be generated internally or externally. The external control signals allow full synchronization with the unit under test (UUT) and minimize the initialization part of the test. An innovative, state-of-the-art algorithmic sequencer allows users to create loops and branches to manipulate the output vectors. All of the sequencer commands can be conditioned using the External Event bus and may be programmed using the Graphical Vector Editor using Windows® API commands or via a script language. This gives the GC5050 the capability to generate test vectors indefinitely at maximum test rates. Internal and external trigger and pause commands are available in several modes. The on-board memory is configurable from 3 MB or 12 MB and is user upgradeable. Separate memories are provided for output data, response data, and test step sequencing commands. The separate memory for response data lets the application read the activity on the UUT pins independent of the bi-directional mode. This is an important feature lacking in most high speed digital I/O applications. The GC5050 operates in any full size PCI slot that provides both 3.3 V and 5 V power supplies and are compatible with the Marvin Test Solutions GT50 and GT25 boards Test vectors. Additionally, firmware can be upgraded using the unique In-System-Programming front panel. The GC5050 offers a variety of I/O modules with input and output levels that meet the requirement of any digital test application, including TTL, PECL, ECL, Programmable Levels, LVDS, and custom modules. I/O module type and memory size must be specified at the time the GC5050 is ordered. The GC5050 can be configured as a Master or as a Slave. The Master provides timing signals for up to 15 Slaves. The board is supplied a 32-bit DLL driver. Various interface files provide access to the DLL from programming tools and languages such as ATEasy, LabVIEW, C/C++, Microsoft Visual Basic®, Delphi, and more. The available virtual panel can be used to interactively adjust and control the instrument from a window that displays the current instrument settings and measurements. On-Line help file and PDF User's Guide provides documentation that includes instructions for installing, using and programming the board.